We enjoyed the Three Reef Snorkel booked through Royal Caribbean. 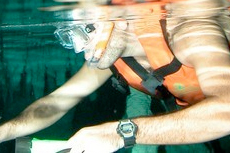 We chose the National Geographic Snorkel excursion. We chose the National Geographic Snorkel excursion. There were about 20 of us on the boat and 3 snorkeled in 3 spots. Especially the first 2 spots were beautiful and abundant with color and sea life! The Fury is awesome. 6th time and always fun ! With Fury Catamaran. Not much snorkling was possible. There were too many people in too little space and all we did was try not to bump into each other for 20 minutes. Worst organized excursion I&apos;ve ever experienced. A very good ship tour in Cozumel is the Fury Catamaran snorkel and beach tour. Had the best time snorkeling ever -- spotted 4 sea turtles! We can&apos;t say enough about this experience.!!! Guides were great. Felt safe with our 10 year old son. The tour guide and the boat crew were fantastic hard working people. The water was rough and we saw very few fish. The water was rough and we saw very few fish. Be aware that the water is often rough (according to what we were told). Great excursion, people extremely friendly. Awesome time with Gus and Charlie...booking easy...easy to get to meeting point...Karla was very professional. We only had 10 people on our boat. A beginner snorkel but we did get to see lots of fish. A beginner snorkel but we did get to see lots of fish. Same guide as the Dune Buggy and again spent too much time repeating directions!! Rain disallowed any good snorkeling but they still stopped and some folks tried. I snorkeled at Sunset Beach, a 25 minute walked from the port. Water was rough the day we went. Only booked with the cruise line as we had to spend out use it or lose it non-refundable credit. Friendly crew and nice snorkeling. Friendly crew and nice snorkeling. Genesis and Danny were very informative and shared their culture with us. The beer after the swim was perfect. My daughter’s favorite snorkeling adventure. not much reef to see. 3 hours snorkeling at 4 different locations. We made no plans before and, again, just decided to see what happens. Treated like children and beginners. The trip was well put together and guides were extremely attentive. The trip was well put together and guides were extremely attentive. The on reef portion of the snorkel was cut short as a number of jellyfish were spotted. However, the colors were amazing in very clear water.